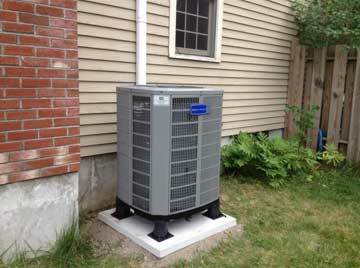 We know that your air conditioner is one of the most important appliances in the house. You don’t want to come home from a long day at work only to find that your air conditioner isn’t working and your house is a sauna. Call Irish Heating and Air today and we’ll perform a 20-point inspection on your air conditioner to ensure it is in proper working order so you won’t have to waste another drop of sweat! We offer annual, quarterly, and on-demand inspections for your air conditioner or furnace. Electrical inspection: we’ll check for exposed or loose wires that could destroy the air conditioner or worse, cause a fire in your home. Refrigerant replacement: this is something you definitely want to let the pros do, since refrigerant can leak harmful gasses into your unit if not properly installed. Did you know that having foliage and debris near your air conditioner can decrease its efficiency? Even a few bent fins on the coil can reduce the effectiveness of your air conditioning unit. Without regular maintenance, the efficiency of your unit can decrease by as much as 5% each year. Additionally, yearly or quarterly service to your air conditioner can help reduce your bill by 15% in addition to preventing further maintenance costs in the future. We always recommend routine preventative maintenance to help prevent unexpected A/C repairs or replacements. Our certified technicians at Irish Heating and Air will perform air conditioner inspections that will help you prevent costly breakdowns and emergency repairs. We can extend the longevity of your air conditioner while also improving efficiency and lowering your out-of-pocket costs over time. Who would say no to that? We certainly wouldn’t! Call us today to schedule an appointment and start saving some cash.